If you've ever been elbowed out of the way at the dinner table by older, stronger siblings, you'll identify with wolves competing with larger bears for food. A study by Utah State University ecologist Aimee Tallian and colleagues reveals wolves might be at more of a disadvantage than previously thought. Tallian is lead author of a paper examining competition between wolves and brown bears on two continents published Feb. 8, 2017, in Proceedings of the Royal Society B. "Wolves and brown bears coexist across most of their range," says Tallian, who completed a doctoral degree from USU in 2017. "Although competition between predators such as these is widespread in nature, we know little about how brown bears affect wolf predation." 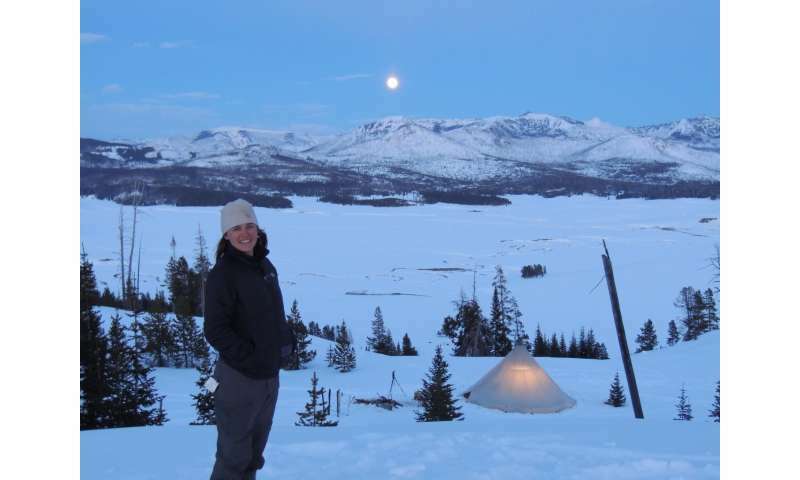 With colleagues in Scandinavia and North America, Tallian examined how brown bears affected wolf kill rates at study sites in northern Europe and Yellowstone National Park. "We found an unexpected pattern," she says. 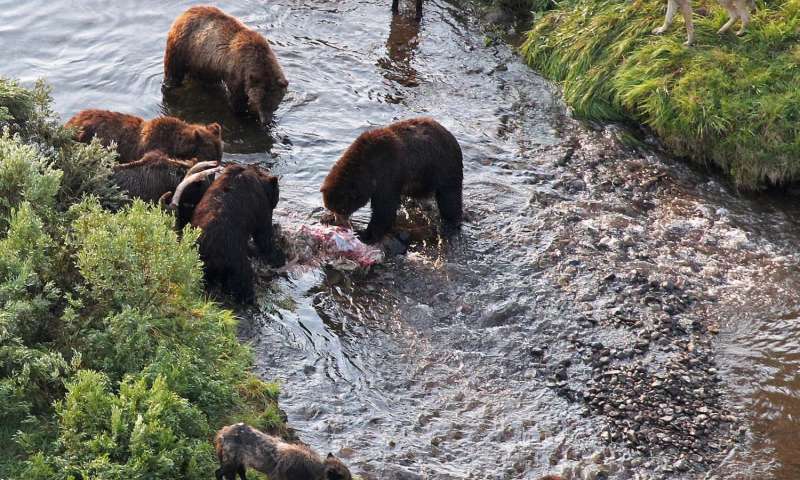 "Wolves killed less often in the presence of brown bears, which is contrary to the common assumption that wolves kill prey more often to compensate for loss of food to bears." Tallian says the consistency in results between the systems on different continents suggests brown bear presence actually reduces wolf kill rate, but the researchers aren't sure why. They surmise wolves, unlike lynx and mountain lion, may not be quickly abandoning their kills, as bears move in take advantage of the spoils. "The wolves may be hanging around longer, waiting their turn to gain access to food," Tallian says. She and her colleagues also wonder if wolves kill less frequently because it takes them longer to find prey. "We think this may be the case, in the spring, when newborn ungulates make easy pickings for bears," Tallian says. "It may simply take more time for wolves to find calves, when there are fewer of them." Interactions between apex predators can either relax or strengthen their effect on prey and predator populations, she says. "The team's results suggest that ignoring such interactions may underestimate the effect competition between predators can have on predator populations," Tallian says. "In addition, it's possible to overestimate the impact of multiple predators on prey populations." A 2012 recipient of a National Science Foundation Graduate Research Fellowship, Tallian's research was performed under a NSF Graduate Research Opportunities Worldwide grant. Additional authors on the paper include Tallian's USU advisor Dan MacNulty, Andrés Ordiz, Camilla Wikenros, Jonas Kindberg, and Håkan Sand of the Swedish University of Agricultural Sciences; Matthew Metz of the University of Montana; Cyril Milleret and Petter Wabakken of Inland Norway University of Applied Sciences; Douglas Smith and Daniel Stahler of Yellowstone National Park and Jon Swenson of the Norwegian University of Life Sciences.